Dress up your space or the space of your child with a custom wood bed frame. Bed frames perform several functions. First, they lift the mattress and bedding up off the floor, second canopy frames allow insect netting to be added, and third they provide visual interest. Historically, floors are prone to drafts and susceptible to vermin of varying sorts. A bed platform makes a way to keep mattress and bedding away from dust and dirt tracked into a room. It also makes it easier to protect it from bedbugs, fleas, and spiders. While mice are rank opportunists for any snuggly place to hide, it also helps keep snakes from cuddling up while you sleep. Most modern homes are not susceptible to these things, but if you have a rustic cabin or if you are renovating an older home, protecting you from the local “wildlife” might be a consideration. Aside from hypothetical critter invaders, an off-the-floor bed just makes it easier to keep bedding clean because sheets, blankets and spreads can be tucked neatly tucked up during the day. A broom can be run under the bed to chase away any dust bunnies. Again, we turn to history. Tall canopy beds were created so as to be able to hang curtains around a bed. The curtains provided privacy. In cold areas, they helped hold in body heat generated by sleepers. Finely woven nets helped ward off flying insects – and that is still a viable use today since mosquitos seem to be able to make their way in just about anywhere. Tall frames also offer decorating opportunities for bed drapes and other items. A lovely bedframe can change an ordinary bedroom into something special, whether it is a lavish declamation of fandom or a serene area for rest and meditation. Bedframes can be simple, richly ornamented or nearly not existent – simply supporting the bedding. They can be an almost stand-alone item, or they can match the other furnishings in the room. To sum it up, a bed frame can be a practical item, assisting with keeping bedding clean. A canopy frame can provide interest or it can protect from drafts and flying insects. But most of all, a bed frame can be simple or beautiful – or somewhere in between. The Glenburn Wooden Bed Frame from Three Posts is a twin sized slatted bed frame suitable for a youth or for a second bedroom. The tall scrolled headboard gives a background for pillows, while the footless frame offers excellent support for box springs and mattress. Teamed with matching furnishings, it’s an excellent choice. 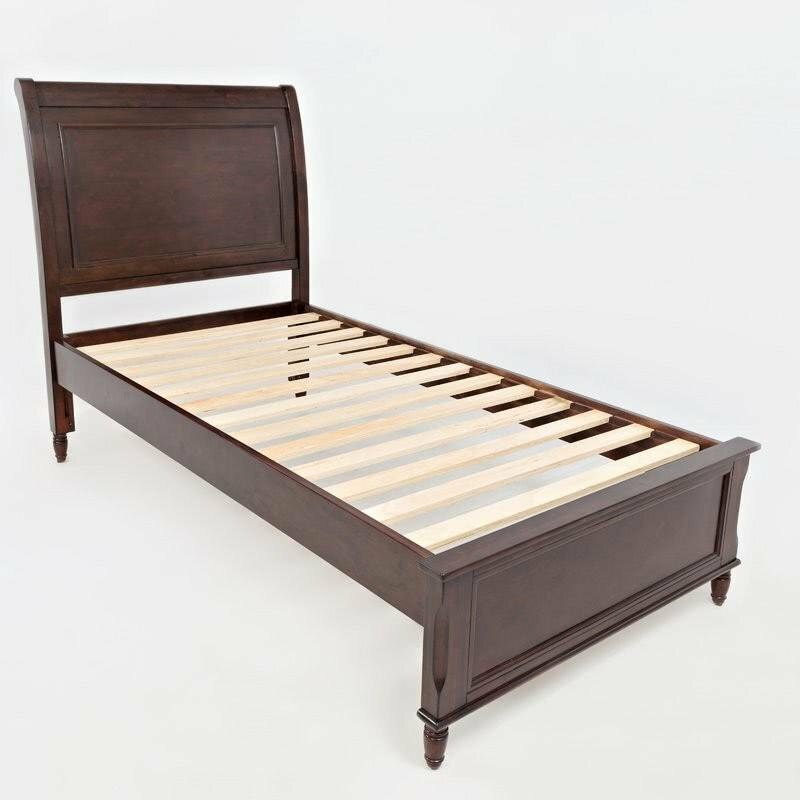 The Larrabee sleigh style bed frame with scrolled headboard and footboard provides slatted support for a mattress. No box spring necessary. The dark wood is a perfect foil for a hobnail bedspread or white on white stitched quilt. It can also support a bright spread, featuring favorite cartoon characters. It’s an excellent choice for a child or youth room. The Chalkhill bed frame offers the opportunity for adding a canopy or mosquito netting. The slender posts at the four corners are without ornamentation. Metal rods with center support create a platform for a mattress. This is an excellent choice for creating a bed with regal drapes, princess curtains or to simply add protection from flying insects. The Camden Bed Frame from House of Hampton combines sleigh bed styling for the headboard and footboard, which can hold a mattress securely offering opportunity to pile on pillows. The neutral coloring is an excellent background for any bed furnishings desired, and can be used by any gender – just add favorite colors, illustrated spread from a favorite movie or a patchwork quilt featuring special clothing. Loudon headboard and bed frame doesn’t require box springs but one could be used for added comfort. The headboard has a sort of camouflage bark pattern in deep brown and gray. It’s an excellent choice for anyone who likes an understated interior decorating theme brought to you from Latitude Run. Beautiful rustic aspen log bed frame with wood burned plank scene in the headboard. It’s perfect for a hunting lodge or rustic farm or cottage setting. Has a mortise and tendon setup with added support in the center. Box springs not required. Put a feather bed on top of an innerspring mattress and make it up with a patchwork quilt for a feel of authenticity. Rich, horizontal woodgrain gives a special touch to this Bruford Bed Frame from Foundry Select. Opposed angled legs and center support give extra stability to the platform. Made from reclaimed mango wood and iron, no box spring is needed. Make up the bed with heavy sheets and an India print spread for a Far East flavor to your décor. Turn your child’s ordinary twin or youth bed into a personal retreat with the Sweedi Bed Frame. Shaped like the frame for a little house, it has neither walls nor any support for a bed but can be used to define a space. It can be used as a support for mosquito netting, or it can be used to define a play space, with no bed at all. Delight a little girl’s heart with this sweet pink and white Baley PU Upholstered Twin Bedframe from Harriet Bee. Teamed up with white furnishings and her favorite bedspread, you can give your little princess the room of her dreams. The hot pink headboard makes the perfect background for ruffled pillows and a cute pajama doll. Place an innerspring mattress or heavy futon on this simple Ollie Bedframe from Modway. It keeps the mattress up off the floor, making room cleaning easy and allowing the addition of embellishments such as dust ruffles or a built-in headboard. This simple bedframe makes personalizing a room as easy as changing a bedspread.